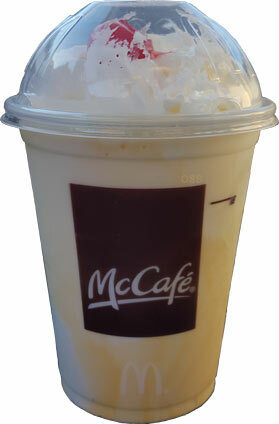 I'll admit it, I kind of feel like a heel for trying the new** McDonald's shake. I mean, eggnog isn't my thing, it's my wife's thing, but, well, I wanted to post about something today. Anyway, I had this shake on this wonderful sunny day and it's not bad. It tastes exactly as you would expect a McDonald's eggnog shake to taste. It's not too strong, nothing offensive going on, and their standard lightweight shake texture to boot. It's distinctly eggnog but stays fairly mellow and reasonable. That's really all there is to it. So, are you interested? **Note: I would have bet you money that the commercial for this said it was new. And while I want to say it didn't seem new, I went with what I thought I heard. Well, It's not even remotely new. Like, they were advertising it way back in 1988! Sorry for not doing more research before posting. I can't find any mention of the shake on McDonald's website at last check. Is availability store-/region-specific? I want to say I heard the commercial on the radio. Not sure why it's not on the website, so maybe best to just drive by your local McD's and see what's up? I drove to 4 different McDonald's today because I promised my daughter an eggnog like last year, but there was no eggnog available in neither store. I can't find the Egg Nog Shake here in Delaware. Highly disappointed. Can't find any mention on the website either. It's like it never existed. Where are you from that you are able to get it? @Rosi: I'm in Mass where they played the radio commercial for it a lot.